Black Friday might not be with us just yet, but Canon has got into the spirit of giving early this year with a raft of ‘double cashblack' deals. The best deal – and by some margin too – is on the EF 100-400mm f/4.5-5.6L IS II USM. Providing you grab it by the 3rd December and follow the relevant T&Cs, you can shave a chunky £600 off the final price. One of Canon’s prized L-series lenses, its solid optical system is encased in a rugged, putty-white barrel. Highlight features include a three-mode Image Stabilizer that can compensate for up to four extra stops of shutter speed, together with multi-layered Air Sphere Coating (ASC) technology to help combat flare and ghosting. The barrel has also been sealed against dust and water incursion, which makes it a perfect match for the company’s DSLRs that boast a similar level of protection. You can use the optic across full-frame cameras such as the EOS 5D Mark IV and EOS 6D Mark II as well as APS-C models, right down to the tiny EOS 4000D if you have a sense of humour. On an APS-C model is provides an effective focal range of 160-640mm, which covers pretty much any eventuality where you may want to use a telephoto lens. 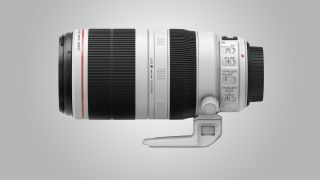 Don’t worry if you’re not in the market for a mammoth telephoto zoom as Canon is offering a range of discounts elsewhere. Other lenses that can be had on the cheap include the popular EF 24-70mm f/4L IS USM, with a generous £350 cashback, as well as the pro-favourite EF 24-105mm f/4L IS II USM, which can now be enjoyed at £220 less. The five-star-winning EF 85mm f/1.4L IS USM, which you may find difficult to justify buying otherwise, also has a hefty £200 saving. A range of DSLRs is also subject to cashback, and the best deal is on the EOS 77D, which receives a £170 saving. The EOS 800D also hasn't escaped the savings, with £100 cashback, while the newest EOS 200D and EOS 2000D are also included in the promotion. Canon hasn’t forgotten about its EOS M series either, with both the EOS M50 and EOS M6 now sporting more attractive final asking prices too. The deals are rounded off by a handful of further reductions on the company’s PowerShot compacts, including the G7 X Mark II, as well as on its TS and PIXMA-series printers. There’s just one flash in the promotion, namely the Canon Speedlite 430EX III-RT, but the £120 reduction here is still significant. Now for the important bit. If you want to grab these cashback deals, you have to make your purchase before 3rd December from one of the approved retailers listed here, and submit your claim before 3rd January. Make sure to give the T&Cs a read to avoid disappointment. If these Canon deals aren't for you, but you still want to pick up a new camera or lens at a great price, keep an eye on our Black Friday and Cyber Monday camera deals page for all the best bargains.